For other uses, see Person of the Year. The tradition of selecting a "Man of the Year" began in 1927, with Time editors contemplating the news makers of the years. The idea was also an attempt to remedy the editorial embarrassment earlier that year of not having aviator Charles Lindbergh on its cover following his historic trans-Atlantic flight. By the end of the year, it was decided that a cover story featuring Lindbergh as the Man of the Year would serve both purposes. Since the list began, every serving President of the United States has been a Man or Person of the Year at least once with the exceptions of Calvin Coolidge (in office at time of the first issue), Herbert Hoover (the subsequent U.S. President), and Gerald Ford. Most were named Man or Person of the Year either the year they were elected or while they were in office; the only one to be given the title before being elected is Dwight D. Eisenhower, in 1944 as Supreme Commander of the Allied Invasion Force, eight years before his election. He subsequently received the title again in 1959, while in office. Franklin D. Roosevelt is the only person to have received the title three times, first as president-elect (1932) and later as the incumbent president (1934 and 1941). In 1999, the title was changed to Person of the Year. Women who have been selected for recognition after the renaming include "The Whistleblowers" (Cynthia Cooper, Coleen Rowley, and Sherron Watkins in 2002), Melinda Gates (jointly with Bill Gates and Bono, in 2005), Angela Merkel in 2015 and "The Silence Breakers" in 2017. Prior to 1999, four women were granted the title as individuals: three as "Woman of the Year"—Wallis Simpson (1936), Queen Elizabeth II (1952), and Corazon Aquino (1986)—and one as half of the "Man and Wife of the Year", Soong Mei-ling (1937). "American Women" were recognized as a group in 1975. Other classes of people recognized comprise both men and women, such as "Hungarian Freedom Fighters" (1956), "U.S. Scientists" (1960), "The Inheritors" (1966), "The Middle Americans" (1969), "The American Soldier" (2003), "You" (2006), "The Protester" (2011) represented on the cover by a woman, and "Ebola fighters" (2014). Although the title on the magazine remained "Man of The Year" for both the 1956 "Hungarian Freedom Fighter" and the 1966 "Twenty-five and Under" editions which both featured a woman standing behind a man, and "Men of the Year" on the 1960 "U.S. Scientists" edition which exclusively featured men on its cover. It was not until the 1969 edition on "The Middle Americans" did the title embrace "Man and Woman of the Year". Despite the name, the title is not just granted to individuals. Pairs of people such as married couples and political opponents, classes of people, and inanimate objects have all been selected for the special year-end issue. In 1949, Winston Churchill was named "Man of the Half-Century", and the last issue of 1989 named Mikhail Gorbachev as "Man of the Decade". The December 31, 1999 issue of Time named Albert Einstein the "Person of the Century". Franklin D. Roosevelt and Mahatma Gandhi were chosen as runners-up. Despite the magazine's frequent statements to the contrary, the designation is often regarded as an honor, and spoken of as an award or prize, simply based on many previous selections of admirable people. However, Time magazine points out that controversial figures such as Adolf Hitler (1938), Joseph Stalin (1939 and 1942), Nikita Khrushchev (1957) and Ayatollah Khomeini (1979) have also been granted the title for their impacts. As a result of the public backlash it received from the United States for naming Khomeini as Man of the Year in 1979, Time has since shied away from using figures who are controversial in the United States for commercial reasons, fearing reductions in sales or advertising revenue. Time's Person of the Year 2001, immediately following the September 11, 2001 attacks, was New York City mayor Rudolph Giuliani. The stated rules of selection, the individual or group of individuals who have had the biggest effect on the year's news, made Osama bin Laden the more likely choice that year. The issue that declared Giuliani the Person of the Year included an article that mentioned Time's earlier decision to select the Ayatollah Khomeini and the 1999 rejection of Hitler as "Person of the Century". The article seemed to imply that Osama bin Laden was a stronger candidate than Giuliani, as Adolf Hitler was a stronger candidate than Albert Einstein. The selections were ultimately based on what the magazine describes as who they believed had a stronger influence on history and who represented either the year or the century the most. According to Time, Rudolph Giuliani was selected for symbolizing the American response to the September 11th attacks, and Albert Einstein selected for representing a century of scientific exploration and wonder. Another controversial choice was the 2006 selection of "You", representing most if not all people for advancing the information age by using the Internet (via e.g. blogs, MySpace, YouTube, and Wikipedia). In 1941, the fictional elephant Dumbo from the Disney movie of the same name was selected to be "Mammal of the Year", and a cover was created showing Dumbo in a formal portrait style. However, the attack on Pearl Harbor on December 7 pre-empted the cover. The U.S. president Franklin Delano Roosevelt was named Man of the Year for a record third time, although Dumbo's Mammal of the Year profile still appeared on the inside pages of the magazine. Film-maker Michael Moore claims that director Mel Gibson cost him the opportunity to be Person of the Year alongside Gibson in 2004. Moore's controversial political documentary Fahrenheit 9/11 became the highest-grossing documentary of all time the same year Gibson's The Passion of the Christ became a box-office success and also caused significant controversy. Moore said in an interview "I got a call right after the '04 election from an editor from Time Magazine. He said,' Time Magazine has picked you and Mel Gibson to be Time's Person of the Year to put on the cover, Right and Left, Mel and Mike. The only thing you have to do is pose for a picture with each other. And do an interview together.' I said 'OK.' They call Mel up, he agrees. They set the date and time in LA. I'm to fly there. He's flying from Australia. Something happens when he gets home... Next thing, Mel calls up and says, 'I'm not doing it. I've thought it over and it is not the right thing to do.' So they put Bush on the cover." On November 24, 2017, U.S. president Donald Trump posted on the social media network Twitter that Time editors had told him he would "probably" be named Person of the Year for a second time, conditional on an interview and photo shoot which he had refused. Time denied that they had made any such promises or conditions to Trump, who was named a runner-up. Time magazine also holds an online poll for the readers to vote for who they believe to be the Person of the Year. While many mistakenly believe the winner of the poll to be the Person of the Year, the title, as mentioned above, is decided by the editors of Time. In the first online poll held in 1998, wrestler and activist Mick Foley won with over 50% of the votes. Foley was removed from the poll, and the title was given to Bill Clinton and Ken Starr, which led to outrage from the fans of Foley who mistakenly believed the winner of the poll would be the winner of the title. In 2006, the poll winner by a wide margin was Hugo Chávez, with 35% of the votes. The president of Iran, Mahmoud Ahmadinejad, came in second. Time again ignored those results, not mentioning them in the announcement of the Person of the Year. Time continues to annually run an online poll for the "People's Choice", but stresses the decision on whom the magazine recognizes is not made by the poll, but by the magazine's editors. 1902–1974 In 1927, Lindbergh became the first person to fly a plane solo non-stop across the Atlantic, from New York to Paris. 1875–1940 In 1928, Chrysler oversaw a merger of his Chrysler Corporation with Dodge before beginning work on the Chrysler Building. 1874–1962 Young chaired a committee which authored 1929's Young Plan, a program for settlement of German reparations after World War I. 1869–1948 Gandhi was the leader of the India's independence movement. In 1930, he led the Salt Satyagraha, a 240-mile march to protest the imposition of taxes on salt by the British Raj. 1883–1945 Laval was first elected Prime Minister of France in 1931. Laval was popular in the American press at the time for opposing the Hoover Moratorium, a temporary freeze on World War I debt payments that was disliked in both France and the US. 1882–1945 Roosevelt won the 1932 US Presidential election by a landslide, defeating the incumbent, Herbert Hoover. 1882–1942 In 1933, Johnson was appointed director of the National Recovery Administration, tasked by US President Franklin D. Roosevelt to bring industry, labor and government together to create codes of "fair practices" and set prices. 1882–1945 Roosevelt was President of the United States from 1933 to 1945. In 1934, Roosevelt's New Deal reforms were beginning to bear fruit. 1892–1975 Selassie was Emperor of Ethiopia in 1935, when Italian forces invaded Ethiopia, starting the Second Italo-Abyssinian War. 1896–1986 In 1936, Simpson's relationship with King Edward VIII led the king to abdicate his throne in order to marry her. 1887–1975 Chiang was Premier of the Republic of China at the outbreak of the Second Sino-Japanese War in 1937. 1898–2003 Soong was wife of Chiang Kai-shek from 1927 until his death in 1975. Addressed as Madame Chiang Kai-Shek by the magazine, she was recognized together with her husband as "Man & Wife of the Year". 1889–1945 As German Chancellor, Hitler oversaw the unification of Germany with Austria and the Sudetenland in 1938, after the Anschluss and Munich Agreement respectively. 1878–1953 In 1939, Stalin was General Secretary of the Communist Party of the Soviet Union and de facto leader of the Soviet Union. He oversaw the signing of a non-aggression pact with Nazi Germany before invading eastern Poland. 1874–1965 Churchill was Prime Minister of the United Kingdom during the 1940 Dunkirk evacuation and the Battle of Britain. 1882–1945 Roosevelt was President of the United States in 1941 during the attack on Pearl Harbor, declaration of war against Japan and resulting entry of the United States into World War II. The editors had already chosen Dumbo as their "Mammal of the Year" before the Pearl Harbor attack, but quickly changed it to Roosevelt. 1878–1953 By 1942, Stalin was General Secretary of the Communist Party of the Soviet Union and Premier of the Soviet Union, overseeing the Battle of Stalingrad (1942–1943). 1880–1959 As United States Army Chief of Staff in 1943, General Marshall was instrumental in organizing US actions in World War II. 1890–1969 General Eisenhower was Supreme Allied Commander in Europe during 1944's Operation Overlord. 1884–1972 Truman became President of the United States after the death of Franklin D. Roosevelt in 1945, authorizing the atomic bombings of Hiroshima and Nagasaki. 1879–1972 In 1946, Byrnes was United States Secretary of State during the Iran crisis of 1946, taking an increasingly hardline position in opposition to Stalin. His speech, "Restatement of Policy on Germany", set the tone of future US policy, repudiating the Morgenthau Plan economic policies and giving Germans hope for the future. 1880–1959 Appointed United States Secretary of State in 1947, Marshall was the architect of the Marshall Plan. 1884–1972 Truman was elected in his own right as President of the United States in 1948, considered to be one of the greatest election upsets in American history. 1874–1965 Proclaimed as the "Man of the half-century", Churchill had led Britain and the Allies to victory in WWII. In 1949, Churchill was Leader of the Opposition. Representing U.S. troops involved in the Korean War (1950–1953). 1882–1967 In 1951, Mossadegh was elected as Prime Minister of Iran and expelled western oil companies, starting the Abadan Crisis. 1876–1967 In 1953, Adenauer was re-elected as Chancellor of West Germany. 1888–1959 As United States Secretary of State in 1954, Dulles was architect of the Southeast Asia Treaty Organization. 1893–1962 Curtice was President of General Motors (GM) from 1953 to 1958. In 1955, GM sold five million vehicles and became the first corporation to earn US$1 billion in a single year. Representing Hungarian revolutionaries involved in the failed 1956 uprising. 1894–1971 In 1957, Khrushchev consolidated his leadership of the Soviet Union, surviving a plot to dismiss him by members of the Presidium, and leading the Soviet Union into the Space Race with the launch of Sputnik 1. 1890–1970 De Gaulle was appointed Prime Minister of France in May 1958 and, following the collapse of the Fourth Republic and establishment of the Fifth Republic, was then elected President of France in December. 1890–1969 Eisenhower was President of the United States from 1953 to 1961. Represented by George Beadle, Charles Draper, John Enders, Donald A. Glaser, Joshua Lederberg, Willard Libby, Linus Pauling, Edward Purcell, Isidor Rabi, Emilio Segrè, William Shockley, Edward Teller, Charles Townes, James Van Allen, and Robert Woodward. 1917–1963 Kennedy was inaugurated as President of the United States in 1961, ordering the failed invasion of Cuba by U.S.-trained Cuban exiles. 1881–1963 John XXIII was head of the Roman Catholic Church from 1958 to 1963. In 1962, he volunteered as a mediator in the Cuban Missile Crisis, gaining praise from both sides. He also initiated the Second Vatican Council that same year. 1929–1968 A leader of the Civil Rights Movement, King delivered his famous "I Have a Dream" speech in 1963. 1908–1973 Johnson was elected in his own right as President of the United States in 1964, before securing the passage of the Civil Rights Act, declaring a War on Poverty and escalating U.S. involvement in the Vietnam War. 1914–2005 General Westmoreland was commander of U.S. forces in South Vietnam during the Vietnam War. Representing a generation of American men and women, aged 25 and under. 1908–1973 Johnson was President of the United States from 1963 to 1969. In 1968, the crew of Apollo 8 (William Anders, Frank Borman and Jim Lovell) became the first humans to travel beyond low Earth orbit, orbiting the Moon and paving the way for the first manned Moon landings in 1969. Also referred to as the silent majority. 1913–1992 As Chancellor of West Germany, Brandt was acknowledged for "seeking to bring about a fresh relationship between East and West" through his "bold approach to the Soviet Union and the East Bloc". 1913–1994 Nixon was President of the United States from 1969 to 1974. Born in 1923 Kissinger, as Nixon's National Security Advisor, traveled with the President to China in 1972. 1904–1992 In 1973, as Chief Judge of the United States District Court for the District of Columbia, Sirica ordered President Nixon to turn over Watergate-related recordings of White House conversations. 1906–1975 Faisal, King of Saudi Arabia, was acknowledged in the wake of the oil crisis of 1973–1974, caused by Saudi Arabia withdrawing its oil from world markets in protest at Western support for Israel during the Yom Kippur War. Represented by Susan Brownmiller, Kathleen Byerly, Alison Cheek, Jill Conway, Betty Ford, Ella Grasso, Carla Hills, Barbara Jordan, Billie Jean King, Carol Sutton, Susie Sharp, and Addie Wyatt. Born in 1924 In 1976, Carter was elected President of the United States, defeating incumbent President Gerald Ford. 1918–1981 Sadat, as President of Egypt, traveled to Israel in 1977—the first Arab leader to do so—to discuss normalization of Egypt-Israel relations. 1904–1997 China's Vice Premier. Deng overthrew Hua Guofeng to assume de facto control over China in 1978, as Paramount Leader. 1902–1989 Khomeini led the 1979 Iranian Revolution, establishing himself as Supreme Leader. 1911–2004 Reagan was elected President of the United States in 1980, defeating incumbent President Jimmy Carter. Born in 1943 Leader of the Polish Solidarity trade union and architect of the Gdańsk Agreement until his arrest and the imposition of martial law in December 1981. Denoted "Machine of the Year" to herald the dawn of the Information Age. 1911–2004 In 1983, as President of the United States, Reagan ordered the invasion of Grenada and championed the Strategic Defense Initiative. 1914–1984 Andropov, as General Secretary of the Communist Party of the Soviet Union, was a strong critic of the Strategic Defense Initiative. Andropov was hospitalized in August 1983 and subsequently died in 1984. Born in 1937 Ueberroth orchestrated the organization of the 1984 Summer Olympics, which involved a Soviet-led boycott. 1904–1997 As Paramount Leader of China, Deng was acknowledged for "sweeping economic reforms that have challenged Marxist orthodoxies". 1933–2009 Aquino was a prominent figure in 1986's People Power Revolution, being elected President of the Philippines. Born in 1931 As General Secretary of the Communist Party of the Soviet Union and leader of the Soviet Union, Gorbachev oversaw Perestroika political reforms in 1987. Planet of the Year, involving an aspect of Mother Nature. Born in 1931 Acknowledged as "Man of the Decade". Gorbachev, as General Secretary of the Communist Party of the Soviet Union (Soviet leader), oversaw 1989's first free Soviet elections before the fragmentation of the Eastern Bloc. 1924–2018 As President of the United States, Bush oversaw U.S. involvement in the Gulf War (1990–1991). Born in 1938 Founder of CNN. The piece particularly highlighted CNN's coverage of Operation Desert Storm and the Gulf War, proclaiming it "History as it happens". Born in 1946 Clinton was elected President of the United States in 1992, defeating incumbent President George H. W. Bush. Represented by Yasser Arafat, F. W. de Klerk, Nelson Mandela, and Yitzhak Rabin. De Klerk, as State President of South Africa, oversaw Mandela's release from prison in 1990. The pair worked together to end the Apartheid system. Arafat, as President of the Palestinian National Authority, and Rabin, as Prime Minister of Israel, signed the 1993 Oslo Accord, the first face-to-face agreement between Palestinian and Israeli authorities. 1920–2005 Pope of the Roman Catholic Church from 1978 to 2005. Born in 1943 Leader of the "Republican Revolution", a Republican party election landslide, which led to Gingrich being elected Speaker of the House. Born in 1952 Ho, a scientist, pioneered much AIDS research. 1936–2016 In 1997, Grove was Chairman and CEO of Intel, recognized as a pioneer in the semiconductor industry. Born in 1946 As President of the United States, Clinton was impeached in 1998 following the Lewinsky scandal. The Senate acquitted him of the charges. Born in 1946 Starr, a lawyer investigating various figures within the Clinton administration, published his Starr Report in 1998, opening the door for the impeachment of Bill Clinton. Born in 1964 Bezos is founder and CEO of Amazon.com. Born in 1946 In 2000, Bush was elected President of the United States, defeating incumbent Vice President Al Gore. Born in 1944 Giuliani was Mayor of New York City at the time of the September 11 attacks in 2001, was selected as a symbol of America's response to the attacks. Represented by Cynthia Cooper, Coleen Rowley and Sherron Watkins. In 2001, Watkins uncovered accounting irregularities in the financial reports of Enron, testifying before Congressional committees the following year. In 2002, Cooper exposed a $3.8 billion fraud at WorldCom. At the time, this was the largest incident of accounting fraud in U.S. history. In 2002, Rowley, an FBI agent, gave testimony about the FBI's mishandling of information related to the September 11 attacks of 2001. Representing U.S. forces around the world, especially in the Iraq War (2003–2011). Born in 1946 In 2004, Bush was re-elected President of the United States, overseeing U.S. involvement in the Iraq War. Represented by Bono, Bill Gates, and Melinda Gates. Bono, philanthropist and member of the rock band U2, helped to organise the 2005 Live 8 concerts. Bill Gates, founder of Microsoft and richest person in the world, and his wife Melinda, founded the philanthropic Bill & Melinda Gates Foundation. Representing individual content creators on the World Wide Web. Born in 1952 In 2007, Putin was ending his second term as President of Russia and preparing to become Prime Minister. Born in 1961 In 2008, Obama was elected President of the United States, defeating John McCain. Born in 1953 Chairman of the Federal Reserve during the financial crisis of 2007–08. Born in 1984 Founder of social-networking website Facebook. Representing many global protest movements — for example, the Arab Spring, the Indignants Movement, the Occupy Movement, and the Tea Party movement — as well as protests in Chile, Greece, India, and Russia among others. Born in 1961 In 2012, Obama was re-elected President of the United States, defeating Mitt Romney. Born in 1936 Elected head of the Roman Catholic Church in 2013, following the resignation of Pope Benedict XVI. "Ebola fighters" refers to health care workers who helped stop the spread of Ebola virus disease during the Ebola virus epidemic in West Africa, including not only doctors and nurses, but also ambulance attendants, burial parties and others. 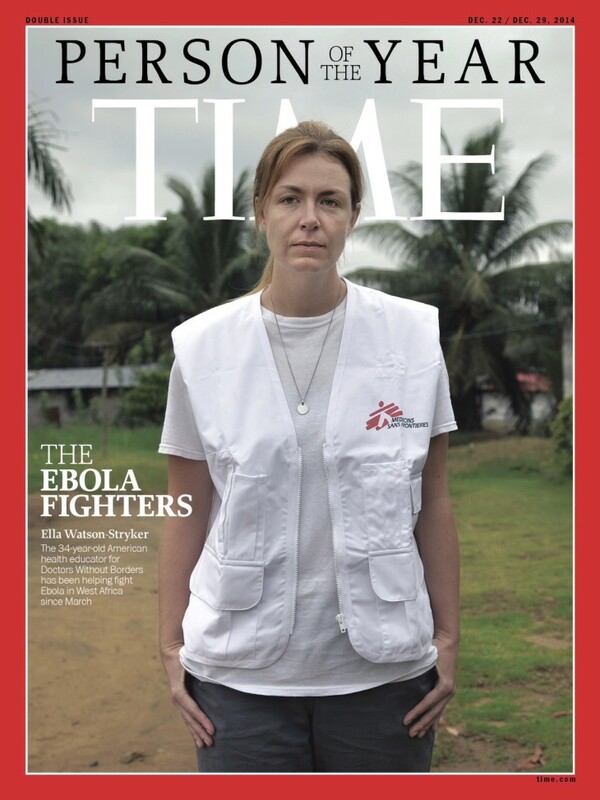 Represented on the covers by Dr. Jerry Brown, the medical director at the Eternal Love Winning Africa Hospital in Monrovia, Liberia, Dr. Kent Brantly, a physician with Samaritan's Purse and the first American to be infected in the 2014 outbreak, Ella Watson-Stryker, a health promoter for Doctors Without Borders who is originally from the United States, Foday Gallah, an ambulance supervisor and Ebola survivor from Monrovia, Liberia, and Salome Karwah, a trainee nurse and counselor from Liberia whose parents died of Ebola, as well as others mentioned in the article itself, such as Dr. Pardis Sabeti from the Broad Institute. Born in 1954 Chancellor of Germany since 2005, recognized for leadership in the Greek debt crisis and European migrant crisis. Born in 1946 In 2016, Trump was elected President of the United States, defeating Hillary Clinton. The people who spoke out against sexual abuse and harassment, including the figureheads of the Me Too movement. Represented on the cover by strawberry picker Isabel Pascual (pseudonym), lobbyist Adama Iwu, actress Ashley Judd, software engineer Susan Fowler, singer-songwriter Taylor Swift, and a sixth woman, a hospital worker who wished to remain anonymous and whose face cannot be seen. The feature also specifically spotlights, in order, actress Alyssa Milano, activist Tarana Burke, actress Selma Blair, the seven plaintiffs in a lawsuit against the Plaza Hotel, politician Sara Gelser, entrepreneur Lindsay Meyer, dishwasher Sandra Pezqueda, actress Rose McGowan, psychotherapist and writer Wendy Walsh, blogger Lindsey Reynolds, housekeeper Juana Melara, journalist Sandra Muller, actor Terry Crews, University of Rochester professors Celeste Kidd and Jessica Cantlon, journalist Megyn Kelly, journalist Jane Merrick, producer Zelda Perkins, European Parliament member Terry Reintke, charity worker Bex Bailey, art curator Amanda Schmitt, filmmaker Blaise Godbe Lipman, and an anonymous former office assistant. Journalists who faced persecution, arrest or murder for their reporting. Those highlighted on four different covers were: Jamal Khashoggi, Washington Post columnist murdered for his criticism of the Saudi crown prince; Maria Ressa, editor of the Philippine news website Rappler, who was indicted for her critical coverage of its president’s controversially violent policies; Wa Lone and Kyaw Soe Oo, Reuters journalists captured in Myanmar while investigating a massacre of Rohingya Muslims; and the staff of The Capital, a Maryland newspaper whose office was targeted by a gunman who killed five of its employees in a mass shooting. The accompanying feature also specifically spotlights the following journalists, in order: Shahidul Alam of Bangladesh, Nguyễn Ngọc Như Quỳnh of Vietnam, Dulcina Parra of Mexico, Luz Mely Reyes of Venezuela, Can Dündar of Turkey, Tatyana Felgenhauer of Russia, Amal Habani of Sudan and Arkady Babchenko of Russia. ^ Eliza Gray. 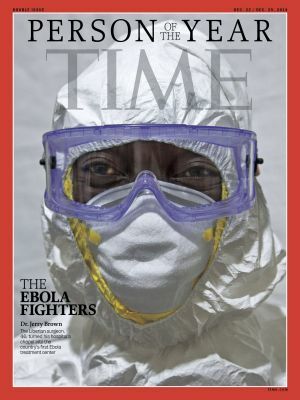 "Person of the Year – TIME". TIME.com. Archived from the original on July 13, 2015. Retrieved July 25, 2015. ^ Person of the Year: 75th Anniversary Celebration (Special Collector's ed.). New York: Time Books. 2002. OCLC 52817840. ^ Time (2002), Person of the Year: 75th Anniversary Celebration, p. 1. ^ The first "Person" of the Year (rather than "Man / Woman " of the Year) was Jeff Bezos of Amazon.com. ^ a b Joan Levenstein. "Mme Chiang Kai-Shek: 1937". Time. Retrieved December 7, 2016. ^ Golden, Frederic (January 3, 2000). "Person of the Century: Albert Einstein". Time. Retrieved February 13, 2008. ^ Time (2002), Person of the Year: 75th Anniversary Celebration, pp. 2, 79. ^ "Person of the Year: A Photo History – Notorious Leaders: Controversial Choices". Time. December 16, 2006. Retrieved September 27, 2013. ^ Time (2002), Person of the Year: 75th Anniversary Celebration, p. 79. ^ "Giuliani named Time's Person of Year". CNN. December 26, 2001. Retrieved December 11, 2018. ^ a b Lev Grossman (December 13, 2006). "You — Yes, You — Are TIME's Person of the Year". Time. Retrieved December 20, 2012. ^ a b "The Timely "Dumbo": Almost a Cover Boy". Walt Disney Family Museum. May 16, 2011. Retrieved December 7, 2017. ^ "Michael Moore Defends Cruise, Slags Gibson". Infectious Greed. September 16, 2006. Retrieved November 29, 2013. ^ Ball, Molly (December 6, 2017). "Donald Trump: TIME Person of the Year Runner Up". Time. Retrieved December 7, 2017. ^ "Mick Foley Cactus Jack Pro Wrestling Legend". Media Man International. 2012. ^ Buechner, M (December 21, 1998). "TIME Man of the Year Poll Roils Internet". time.com. TIME Digital. Retrieved April 15, 2015. ^ "Chavez wins "Person of the Year" poll ... Time magazine ignores result". Hands Off Venezuela. December 18, 2006. Archived from the original on June 27, 2009. Retrieved December 5, 2009. ^ Stacey Leasca (December 19, 2012). "Time's 'Person of the Year' is Barack Obama". Global Post. Retrieved November 29, 2013. ^ Larsen, Roy (January 5, 1970). "A Letter From The Publisher". Time. ^ Jennings Parrott (December 30, 1985). "Time Picks China's Deng Xiaoping as Man of the Year". Los Angeles Times. ^ NBC News Staff (December 17, 2006). "Time magazine's 'Person of the Year' is ... You". TIME. ^ "Person of the Year 2007". Time. 2007. Retrieved July 8, 2009. ^ TIME Staff (December 19, 2007). "Complete List – Person of the Year 2007". TIME. ^ Von Drehle, David (December 17, 2008). "Person of the Year 2008". Time. Retrieved December 17, 2008. ^ TIME Staff (December 17, 2008). "Person of the Year 2008". TIME. ^ Grunwald, Michael (December 16, 2009). "Person of the Year 2009". Time. Retrieved December 16, 2009. ^ TIME Staff (December 16, 2009). "Person of the Year 2009". TIME. ^ Grossman, Lev (December 15, 2010). "Person of the Year 2010". Time. Retrieved December 15, 2010. ^ TIME Staff (December 15, 2010). "Complete List – Person of the Year 2010". TIME. ^ Grunwald, Michael (December 14, 2011). "Person of the Year 2011". Time. Retrieved December 14, 2011. ^ TIME Staff (December 14, 2011). "Complete List – Person of the Year 2011". TIME. ^ Michael Scherer (December 19, 2008). "Person of the Year 2012". Time. Retrieved December 23, 2012. ^ "Person of the Year 2012". Time. December 19, 2012. Retrieved January 20, 2019. ^ "Pope Francis, The People's Pope". Time. December 11, 2013. Retrieved December 11, 2013. ^ "Pope Francis: Person of the Year 2013". Time. December 11, 2013. ^ a b "The Choice". Time. December 10, 2014. Retrieved December 10, 2014. ^ Eliott C. McLaughlin, CNN (December 10, 2014). 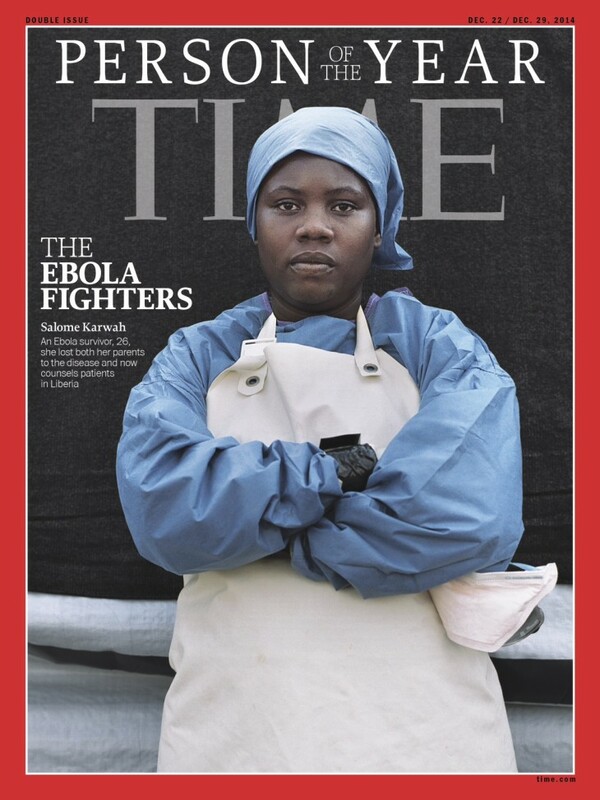 "Ebola fighters are Time's 'Person of the Year'". CNN. Retrieved July 25, 2015. ^ "Image: 1418243285733.jpg, (300 × 400 px)". The Sydney Morning Herald. 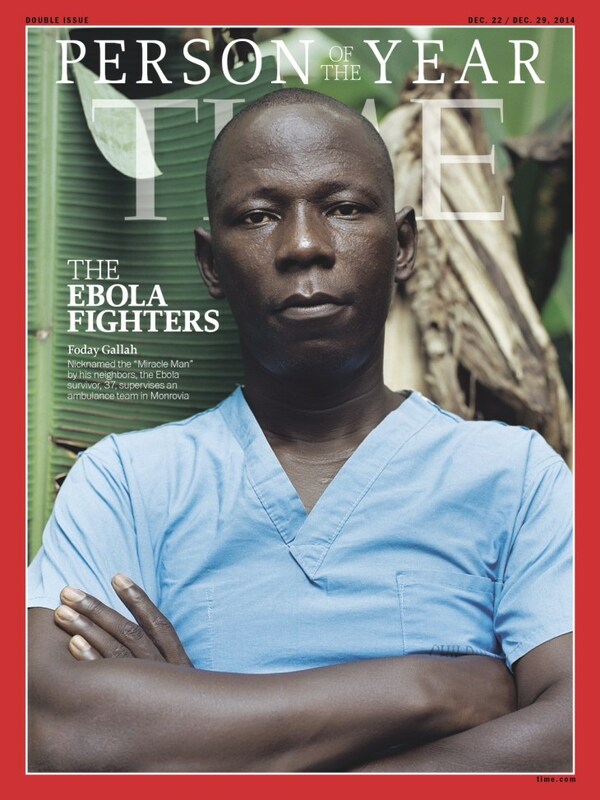 ^ a b c d e "TIME Person of the Year 2014: Ebola Fighters". TIME.com. December 10, 2014. Retrieved July 25, 2015. ^ "Image: article-time2-1210.jpg (970 × 1293 px)". Daily News. New York. ^ "Image: 1D274907403248-ella.blocks_desktop_large.jpg, (730 × 974 px)". media2.s-nbcnews.com. Retrieved September 23, 2015. ^ "Image: 1D274907403249-foday.blocks_desktop_large.jpg, (730 × 974 px)". media2.s-nbcnews.com. Retrieved September 23, 2015. ^ "Image: 1D274907403247-salome.blocks_desktop_large.jpg, (730 × 974 px)". media4.s-nbcnews.com. Retrieved September 23, 2015. ^ Nancy Gibbs (December 9, 2015). "The Choice: Why Angela Merkel is TIME's Person of the Year 2015". TIME. ^ "TIME Person of the Year 2015 Runner-Up: Abu Bakr al-Baghdadi". TIME. December 9, 2015. ^ "TIME Person of the Year 2015 Runner-Up: Donald Trump". TIME. December 9, 2015. ^ "TIME Person of the Year 2015 Runner-Up: Black Lives Matter". TIME. December 9, 2015. ^ "TIME Person of the Year 2015 Runner-Up: Hassan Rouhani". TIME. December 9, 2015. ^ "TIME Person of the Year 2015 Runner-Up: Travis Kalanick". TIME. December 9, 2015. ^ "TIME Person of the Year 2015 Runner-Up: Caitlyn Jenner". TIME. December 9, 2015. ^ "Hillary Clinton: TIME Person of the Year 2016 Runner Up". TIME. December 7, 2016. ^ "Hackers: TIME Person of the Year 2016 Runner Up". TIME. December 7, 2016. ^ "Recep Tayyip Erdogan: Turkish President Who Resisted a Coup". TIME. December 7, 2016. ^ "CRISPR Technology Scientists on Their Gene Editing Tool". TIME. December 7, 2016. ^ "Beyonce: TIME Person of the Year 2016 Runner Up". TIME. December 7, 2016. ^ Zacharek, Stephanie; Dockterman, Eliana; Edwards, Haley Sweetland. "TIME Person of the Year 2017: The Silence Breakers". Time. Retrieved December 6, 2017. ^ Borchers, Callum (December 6, 2017). "Time's Person of the Year isn't Trump. It's basically the opposite of Trump". Washington Post. Retrieved December 6, 2017. ^ "Donald Trump: TIME Person of the Year 2017 Runner Up". Time. Retrieved January 21, 2019. ^ "Xi Jinping: TIME Person of the Year 2017 Runner Up". Time. Retrieved January 21, 2019. ^ "Robert Mueller: TIME Person of the Year 2017 Runner Up". Time. Retrieved January 21, 2019. ^ "Kim Jong Un: TIME Person of the Year 2017 Runner Up". Time. Retrieved January 21, 2019. ^ "Colin Kaepernick: TIME Person of the Year 2017 Runner Up". Time. Retrieved January 21, 2019. ^ "Patty Jenkins: TIME Person of the Year 2017 Runner Up". Time. Retrieved January 21, 2019. ^ Kim, Eun Kyung (December 11, 2018). "TIME's 2018 Person of the Year: 'The Guardians and the War on Truth'". Today Show. Retrieved December 11, 2018. ^ Vick, Karl. "TIME Person of the Year 2018: The Guardians". Time. Retrieved December 12, 2018. ^ "Donald Trump: TIME Person of the Year 2018 Runner Up". Time. December 11, 2018. Retrieved January 21, 2019. ^ "Robert Mueller: TIME Person of the Year 2018 Runner Up". Time. December 11, 2018. Retrieved January 21, 2019. ^ "The Activists: TIME Person of the Year 2018 Runner Up". Time. December 10, 2018. Retrieved January 21, 2019. ^ "Moon Jae-in: TIME Person of the Year 2018 Runner Up". Time. December 10, 2018. Retrieved January 21, 2019. ^ "Ryan Coogler: TIME Person of the Year 2018 Runner Up". Time. December 10, 2018. Retrieved January 21, 2019. ^ "Meghan Markle: TIME Person of the Year 2018 Runner Up". Time. December 10, 2018. Retrieved January 21, 2019. Wikimedia Commons has media related to Time magazine Persons of the Year. "Time's Person of the Year 1927–2011". Time. 2011. Retrieved December 8, 2016.